, or Launoius, a very learned man and voluminous writer, was born about 1601, and took a doctor of divinity’s degree in 1636. He made a journey to Rome, for the sake of enlarging his ideas and knowledge; and there procured the esteem and friendship of Leo Allatius and Holsten. Upon his return to Paris, he shut himself up, entering upon an extensive course of reading, and making collections upon all subjects. He held at his house every Monday a meeting where the learned conversed on many topics, but particularly on the discipline of the church, and the rights of the Gallican church; and they cordially agreed in condemning such legends as the apostolate of St. Dionysius the Areopagite into France, the voyage of Lazarus and Mary Magdalen into Provence, and a multitude of other traditions. | Launoi was such an enemy to legendary saints, that Voltaire records a curate of St. Eustachius, as saying, “I always make the most profound obeisance to Mr. Launoi, for fear he should take from me my St. Eustachius.” He died at cardinal d‘Estr^es’s hotel, March 10, 1678, aged 75, and was buried at the convent of the Minimes de la Place Ro’iale, to whom he left two hundred crowns in gold, all the rituals which he had collected, and half his books; bequeathing the remainder to the seminary at Laon. 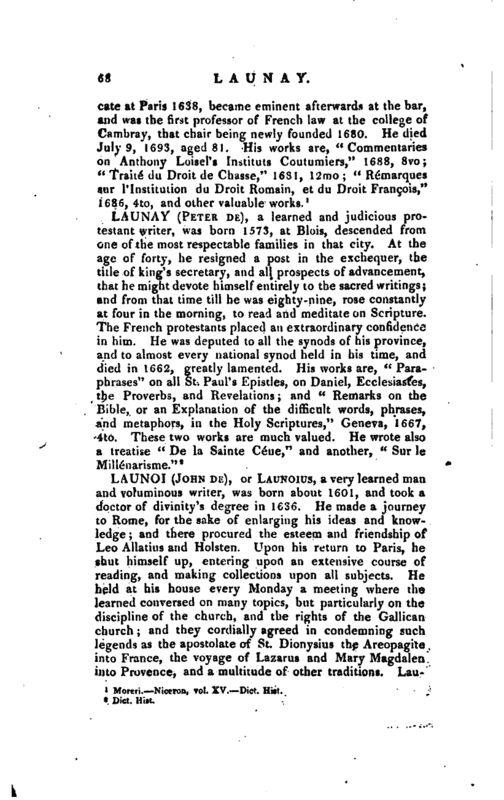 Few men were so industrious and so disinterested, as M. de Launoi, who persisted in refusing all the benefices which were offered him, and lived in a plain, frugal manner, contented with his books and his private fortune, though the latter was but moderate. 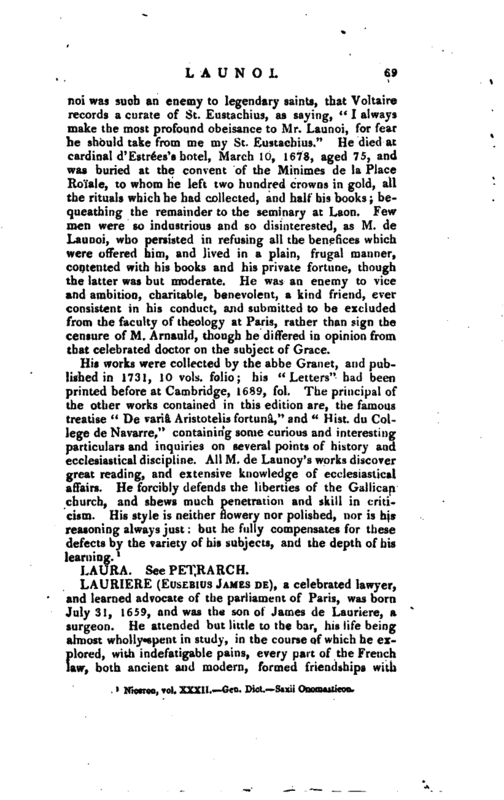 He was an enemy to vice and ambition, charitable, benevolent, a kind friend, ever consistent in his conduct, and submitted to be excluded from the faculty of theology at Paris, rather than sign the censure of M. Arnauld, though he differed in opinion from that celebrated doctor on the subject of Grace. Niceron, vol. XXXII.—Gen. Dict.—Saxii Onomasticon.